Using a variety of drum and percussion instruments, Christopher Ramirez creates interactive group drumming that will take participants on a rhythmic journey. 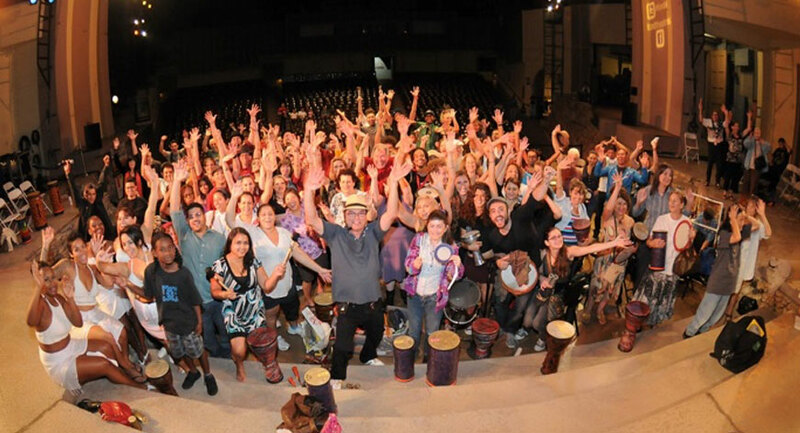 Christopher Ramirez founded Freedom Drum Circles to invigorate communities around the globe through recreational music. He uses the power of drums and percussion instruments to build confidence and promote socially creative unity within a musical experience. His group drumming is inclusive, interactive and transformational for all participants at any skill level. Christopher Ramirez is a bilingual (English/Spanish) percussionist and composer distinguishing himself as a motivational rhythm facilitator. He is a Remo USA endorsed artist, both a trained Village Music Circles and HealthRhythms facilitator, and a member of the Drum Circle Facilitators Guild. Christopher has led multiple Ford Theatres JAM Sessions on site and in Los Angeles communities since 2008. Freedom Drum Circles’ rhythm programs are tailored to serve any occasion: educational programs, team building activities, wellness programs, community events, festivals, museums, ceremonies, company retreats, conventions, concerts, private celebrations, at-risk-youth programs, autism camps, senior citizen groups, rehab and recovery organizations.